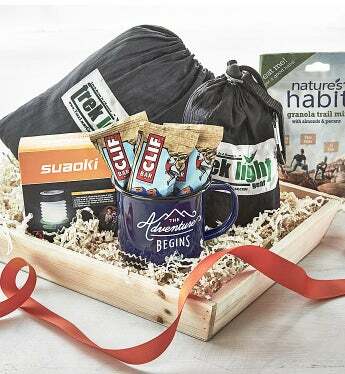 This adventuresome gift crate is designed for the daring dad who loves fresh air, beautiful vistas, and long relaxing hikes. Afterward, he will enjoy lounging in the Trek Light Portable Hammock which only weighs 14 ounces. The Go Anywhere Rope Kit makes it a snap to set up between a couple of well-placed trees. Other must-haves included are a solar camping lantern, The Adventure Begins blue enamel camping mug, a handy caribiner with compass, a trio of CLIF BAR Chocolate Chip Energy Bars and Nature's Habit Granola Trail Mix. Trek Light Portable Hammock - This handy hammock only weighs 14 ounces and is one foot shorter than a standard hammock but just as comfortable. It holds up to 400 pounds and has a specially designed static nylon cord that is lightweight and already cut, knotted and ready for set up right out of the pouch. Trek Light go Anywhere Rope Kit - Weighing in at only 7 ounces, the Go Anywhere Rope allows you to easily setup, adjust and tension your hammock anyway you like - this item is an absolute must partner for the Trek Light Hammock! The Adventure Begins Blue Enamel Camping Mug by Gentlemen's Hardware - a fresh new take on the camping classic. Perfect for hot or cold beverages, soups, or stews. Rugged and durable. 9 ounces. Suaoki Solar Camping Lantern - this environmentally-friendly light has three brightness settings and can last up to 12 hours without additional sunlight. It can be pulled open to be a LED lantern or collapsed to be a mini flashlight. It has a solar panel for recharging as well as a 5V USB port. It also has an SOS flashing light for use in emergencies. The Adventure Begins Blue Enamel Camping Mug by Gentlemen's Hardware 9 ounce capacity.